Madrid is a city full of wonderful sights and mouth-watering food! Delight yourself on this tour with a combination of it all. I will take you to the cities most historical sights, where you'll learn about the significance of each monument we visit. Most of the information I'll give you other tourists would never be told, so you can guarantee you will be getting a great, informational tour. Afterwards, we will make our way a variety of family-fun tapas taverns where you will try authentic dishes made from local ingredients. Throughout our journey to the tapas taverns, I'll be sharing more history about the taverns we visit and the food we eat! 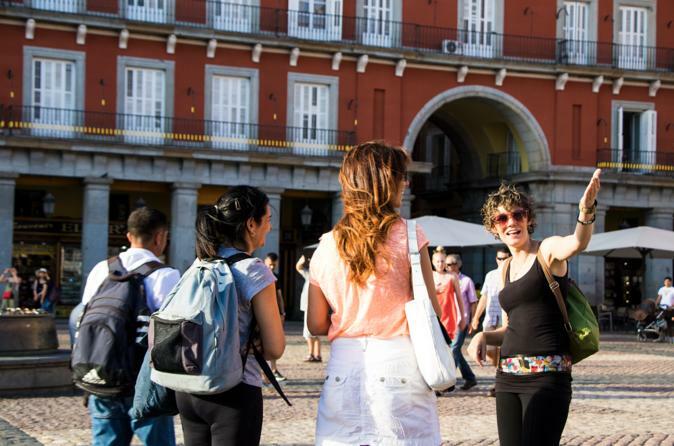 This tour will give you the best culture expeience of Madrid in a non touristy way, with a local guide! I'll be taking you to taverns only us locals know about, insuring that you are getting a once in a life-time expereince without tourist-trap activities! Tour the major monuments of Madrid's historical center. Savour 10+ delicious tapas in 4 bustling family-run tapas taverns. Learn fascinating stories about Madrid's history and culture. End of tour. I will be happy to answer any questions or give recommendations for your stay. If you are looking to get a true taste of Madrid, this tour is perfect for you, as we'll be experiencing the traditional Madrid tapas hopping in four local tapas taverns. During this exciting evening we will taste 10 mouthwatering tapas, including the most famous: jamón ibérico de bellota (acorn fed Iberian ham) and pair them with Spanish wine. Rest assured that this experience is the best combination of Spanish food, wine and history, the best that Madrid has to offer.